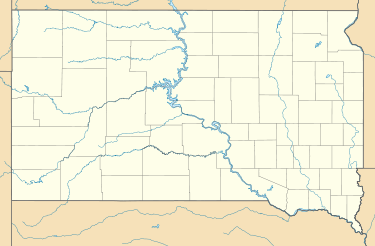 The List of National Historic Landmarks in South Dakota contains the landmarks designated by the U.S. Federal Government for the U.S. state of South Dakota. There are 16 National Historic Landmarks (NHLs) in South Dakota, one of which is shared with Iowa and listed by the National Park Service as primarily in that state. They have been designated in 13 of South Dakota's 66 counties. Most are along rivers, long the chief areas of human settlement in this arid place. Hughes Archaeological site of a fortified 15th-century Native American village, believed to be Arikara. Hanson This fortified archaeological site preserves the remains of about 25 rectangular houses dating to c. 1000 CE. The site also once contained several burial mounds, which were later destroyed by cultivation. The site was perhaps occupied by ancestors of the Mandan. 43°58′48″N 99°19′54″W﻿ / ﻿43.98°N 99.331667°W﻿ / 43.98; -99.331667﻿ (Crow Creek Site) Buffalo Site of a prehistoric Native American massacre circa 1325. 44°22′19″N 103°44′00″W﻿ / ﻿44.371944°N 103.733333°W﻿ / 44.371944; -103.733333﻿ (Deadwood Historic District) Lawrence Historic mining town. 43°44′30″N 98°02′02″W﻿ / ﻿43.7416°N 98.034°W﻿ / 43.7416; -98.034﻿ (Mitchell Site) Davison Archaeological site of a prehistoric Mississippian culture village. Open to the public. 45°27′25″N 100°21′15″W﻿ / ﻿45.456944°N 100.354166°W﻿ / 45.456944; -100.354166﻿ (Molstad Village) Dewey A fortified prehistoric village of five circular house rings enclosed by a ditch comprises this archaeological site. It represents a transitional period as the Mandan, Hidatsa, and Arikara peoples arose from the mixing of Central Plains and Middle Missouri cultural traits. National Historic Sites, National Historic Parks, National Memorials, and certain other areas listed in the National Park system are historic landmarks of national importance that are highly protected already, often before the inauguration of the NHL program in 1960, and are often not also named NHLs per se. Two additional South Dakota sites have national historical importance and have been designated as National Historic Site and as a National Memorial by the National Park System. ^ Neuman, Robert W. "Projectile Points from Preceramic Occupations Near Fort Thompson, South Dakota: A Preliminary Report". Plains Anthropologist 9.25 (1964): 173-189: 176. ^ a b c d National Park Service (June 2011). "National Historic Landmarks Survey: List of National Historic Landmarks by State" (PDF). Archived from the original (PDF) on 2011-11-05. Retrieved 2011-07-04. .
^ a b National Park Service. "National Historic Landmark Program: NHL Database". Archived from the original on 2004-06-06. Retrieved 2007-09-22. This page was last edited on 15 September 2018, at 14:55 (UTC).